The history of the brown suede shoe dates back to one of the first visits of the Prince of Wales to America. This shoe has been talked about by style scouts and fashion writers ever since. At first (and for a long time), there was a question as to the correct model. Then, the issue arose as to whether brown suede shoes should be worn for business or kept solely for casual wear. I am here to report that the brown suede shoe, in its 2 most popular models — the plain cap-toe oxford lace-up and the monk strap — will be the high spot of fashion this summer season. While there are many more shoes of many other types, it was not the least bit surprising to me to see men walking downtown wearing brown suede shoes this spring. And this trend will continue into summer. The brown suede shoe is not only here to stay, but it is destined to become your favorite shoe once you experience its unique style. 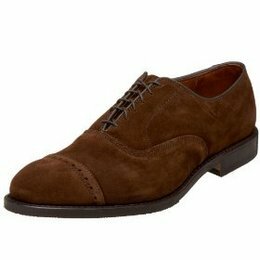 Brown suede shoes should be purchased by men of all ages as a smart, correct and highly desirable fashion statement.